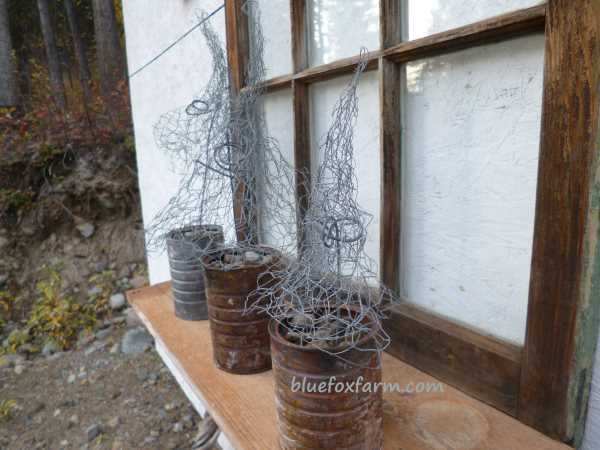 There's nothing quite as countrified as chicken wire - the smaller the holes, the better. These little trees are simple to make, using only a few easy to find supplies, so make your own Prim forest for a mantel display. The coffee cans were burned on the bonfire to give them that appealing weathered and aged look. I had some lengths of chicken wire around, and a lot of gravel to fill the cans and give the stems some stability. After that, it's just a matter or putting it all together. Thick gauge but flexible, this fence wire is cut into lengths of around a foot - variation is fine to give your display that country look. 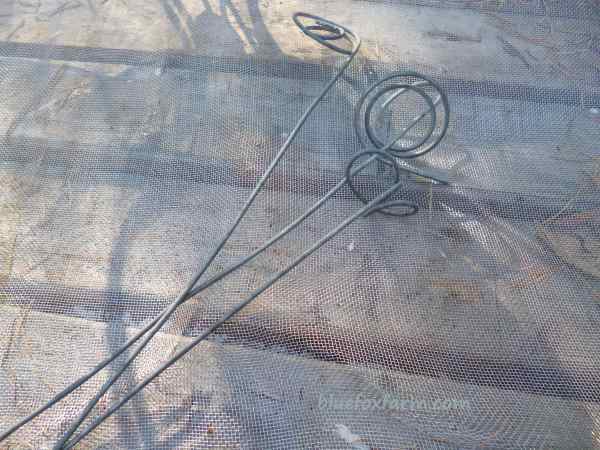 A loop is bent into the top end of the wire to allow the chicken wire to be held securely in place. 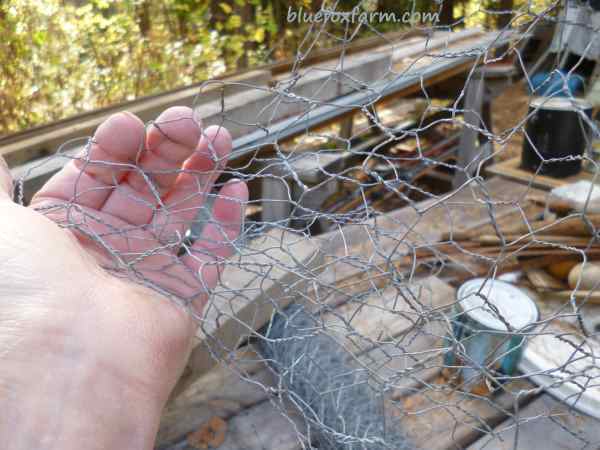 Chick type chicken wire has holes about one inch across. I weight it down with a piece of wood, or it tries to roll up again. 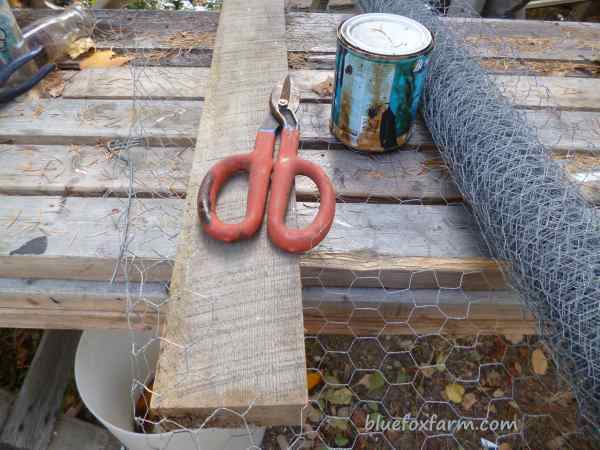 The chicken wire is cut into a rough circle, and then pinched in the middle, with the edges draping down over the galvanized wire piece. 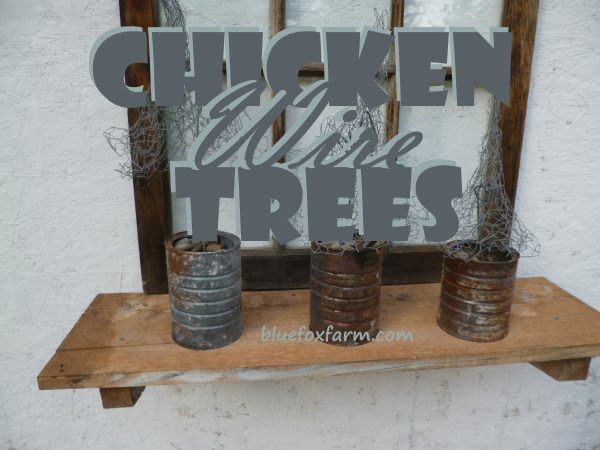 Pull the end of the wire so it goes through a couple of the strands of chicken wire, then pinch and fold the chicken wire into a tree shape. Wear gloves for this part, or avoid the sharp ends. I like the Dr. Seuss look, but use whatever shape you like; slender and elegant, or all different, or round like a topiary. Drill a hole into the middle of a piece of wood, either a tree branch or a small square scrap of lumber. The more aged the better, or use the weathering technique here to give it a weathered appearance. Insert the end of the stem wire into the wood so it stands up, display singly or in a group for your very own primitive forest scene. Here I've just used some tin cans, aged in the fire, filled with gravel for the stands.